Day 3: (B, L, D) Yerevan - Echmiadzin - Zvartnots - Yerevan. Day 4: (B, L, D) Yerevan - Khor-Virap - Noravank - Karahunj - Stepanakert. Breakfast. Khor Virap dates back to 4th – 17th centuries and offers the best view of the Sacred Mountain Ararat where Noah's Ark landed. 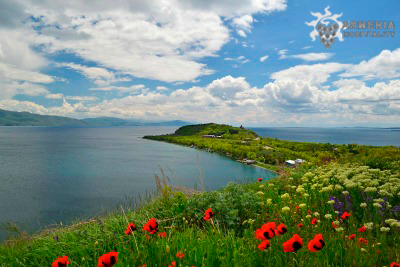 Khor Virap is one of the most popular destinations in Armenia. It is the place where Grigor Luisavorich (St. Gregory the Illuminator) was imprisoned for 13 years for preaching the word of Christ. He converted King Trdat III in 301 and the King adopted Christianity as the state religion. Noravank Monastery is situated deep in the Noravank canyon, and from a distance appears to be perched high on the flat surface of a rock, nestled into a majestic mountain. The main church of St. Karapet was built in 1221-1227. Lunch in the restaurant in Noravank. Karahunj, Zorakarer is 3, 500 years older than England’s Stonehenge and 3, 000 years older than the Egyptian pyramids. The total area of the observatory is 7 hectares. According to the scientist’s findings, a temple consisting of 40 stones built in honor of the Armenians’ main God, Ari, meaning the Sun, is situated in the central part of Carahunge. Besides the temple, it had a large and developed observatory, and also a university that makes up the temple’s wings. Then drive to Stepanakert. Dinner. Night in the hotel in Stepanakert. Day 5: (B, L, D) Stepanakert - Gandzasar - Shushi - Stepanakert. Breakfast. Departure for the monastery of Gandzasar. It is perhaps the most important architectural monument of Artsakh. It is located near the town of Vank of the Mardakert district of the Karabakh Republic, in the very heart of Artsakh's historical province of Khachen. For long a symbol of Artsakh's Armenian statehood, the word "Gandzasar" is translated from Armenian as "Treasure-Mountain". Lunch. Visit to the city of Shushi. The chuch of Ghazanchetsots, Mosques, Ganach Jham, City Walls. Shushi is a very historic town, with old city walls, churches and even mosques, from the pre-war mixed population. Now semi-abandoned, it still has a lot of natural and architectural beauty to offer visitor. Return to Stepanakert. Dinner. Night in the hotel in Stepanakert. Day 6: (B, L, D) Stepanakert - Tatev - Selim - Noraduz - Sevan. Breakfast. Visit to the monastery of Tatev. The monastery was built during the 9-13th centuries as an Armenian intellectual center where philosophers, musicians, painters, calligraphers and monks lived. This monastery’s teachers produced manuscripts for the whole Armenian world. Lunch. Visit to the caravanserai of Selim, best preserved in Armenia on the ancient silk road. 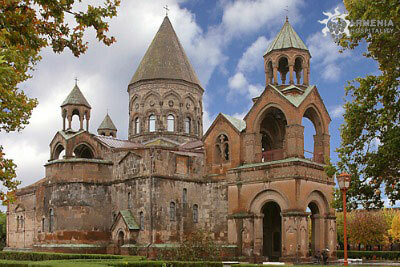 Then visit to Noraduz - the art of khachkar (cross-stone) is the most original manifestation of Armenian medieval culture. 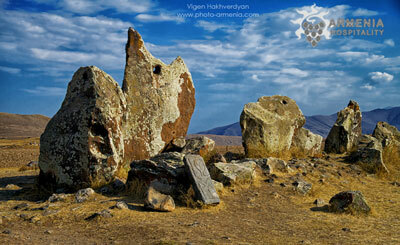 Noraduz which is truly considered a forest of khachkars and open-air museum, displays hundreds of khachkars. This is a unique place, where one can reveal the development of khachkarial art in its historical process. Dinner and night in the hotel in Sevan. Day 7: (B, L, D) Sevan - Haghartsin - Goshavank - Yerevan. Day 8: (B, L, D) Yerevan - Garni - Geghard - Yerevan. The Garni Fortress was built in the 3rd century BC on a triangular plateau. The elevated site juts outover a deep canyon and enjoys natural protection on three of four sides by the deep valley and rocky cliffs. 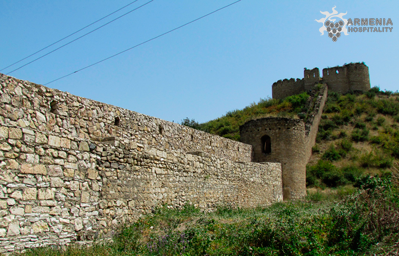 A 300 m wide fortress wall was constructed on the fourth side in the 3rd century BC featuring 14 towers and an arched entryway. Virtually impregnable, it was one of the most legendary fortresses of ancient Armenia. The astounding Geghard monastery is situated 6 km from the temple at Garni and is revered throughout Armenia as one of the country's greatest spiritual and cultural centers. First called Ayrivank, or the Monastery of the Caves, the history of Geghard dates back to pre-Christian times. Vernisaje – handicraft open air market for souvenirs. Farewell party Dinner in traditional Armenian restaurants. Night in the hotel.